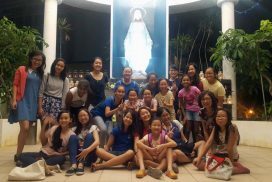 We are a community of girls aged from 9-20 years old, that serve the Parish by presenting the offertory gifts at Mass. New girls undergo a training and formation program before being commissioned as Gift Bearers (GBs). We meet every Friday for 6.30pm mass, followed by dinner and recitation of the rosary. Girls aged 13 and above stay on for Bible sharing. Once a year, we gather for a camp in June and a retreat in December. We also take part in other ministry/Parish activities such as canteen and the Passion Play.